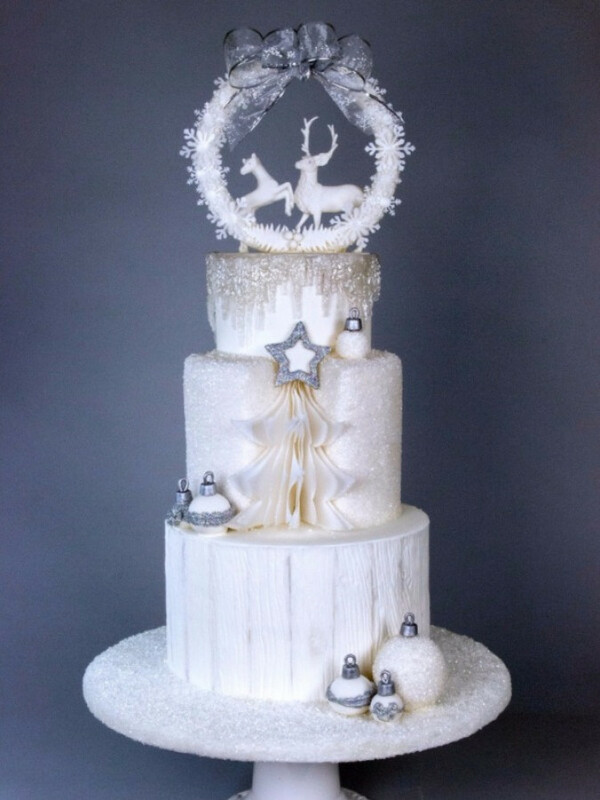 of Wheaton’s Fancy Cakes in Hammonds Plains, Nova Scotia, Canada produced a magical white holiday wedding cake for the White Christmas issue of Cake Central Magazine Volume 7 Issue 5. 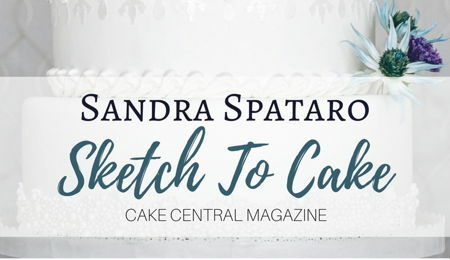 Nancy’s shares her process on sketching to creating her gleaming holiday wedding cake inspired by the dazzling view from her home in beautiful, eastern Canada. When I first saw the photo for inspiration, I thought to myself…this couldn’t be anymore Eastern Canadian if it had to be. The white snow covered trees, the glistening icicles, the beautiful deer, the Christmas baubles, and of course a sparkly star. Somedays, when I look out my patio window, this is exactly what I see. 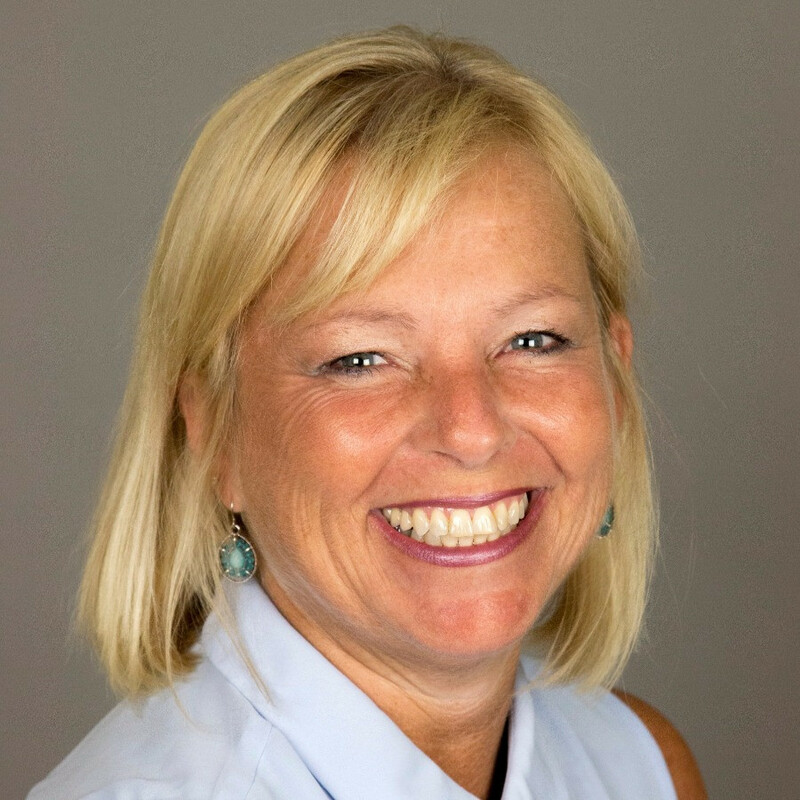 I was so elated to have such wonderful inspiration! The brainstorming started immediately. I had to write things down as they were flooding my head so quickly. 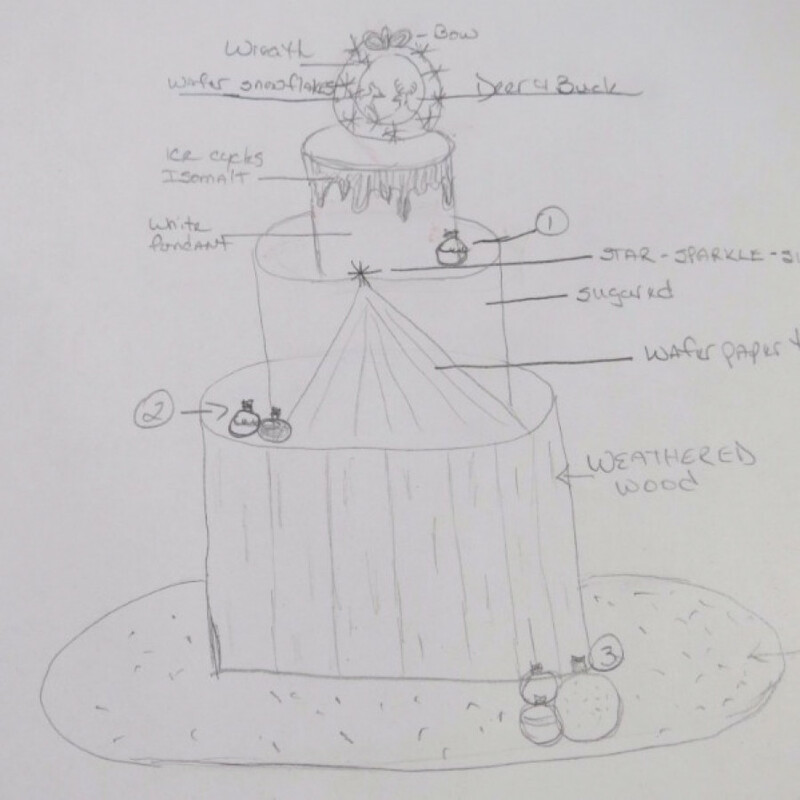 After jotting down some of the ideas I started to sketch my cake. This took several attempts as I am not the best at this part. 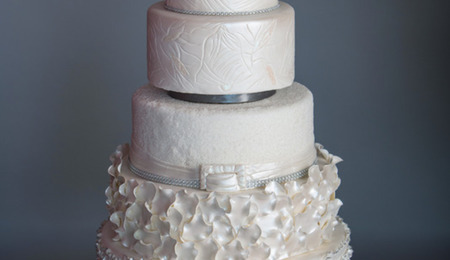 I knew I wanted a 3 tier cake with a wreath on the very top. I played with dummy foam cakes to get the sizes and dimensions of the cake and soon had my design ready to execute. When I create a sketch I normally stick very close to it. I usually have everything right down to colour and techniques incorporated and seldom change anything. I didn’t have to make any changes to my original design except for the shape of the bow at the top of the wreath. I tried several different bow types and I liked the 4 loop bow the best for this project. I started with the bottom tier first. I absolutely love the weathered wood look so I began the wafer paper fondant technique . I knew I had to have an all white or shades of white cake so I had to be careful with using the grey/black to shade the wood. Next, I had to cut a triangle shape out of tier number 2 for the wafer paper tree. This was a little tricky as getting those lines perfect would be a bit of a chore, after all ,this could be my first piece ever showcased in a magazine! 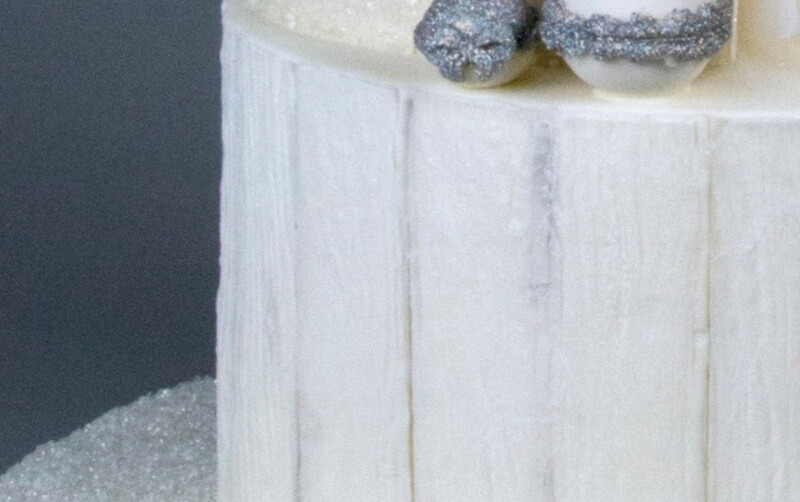 I covered the cake in fondant and then covered it in a sugar/sparkle.I cut out several tree branches from wafer paper and sugar glued them to the fondant. Then I cut out the star and used my silver sparkle dust to create the magic to bring the tree to life. Everything is so much nicer with sparkle..I truly believe that! 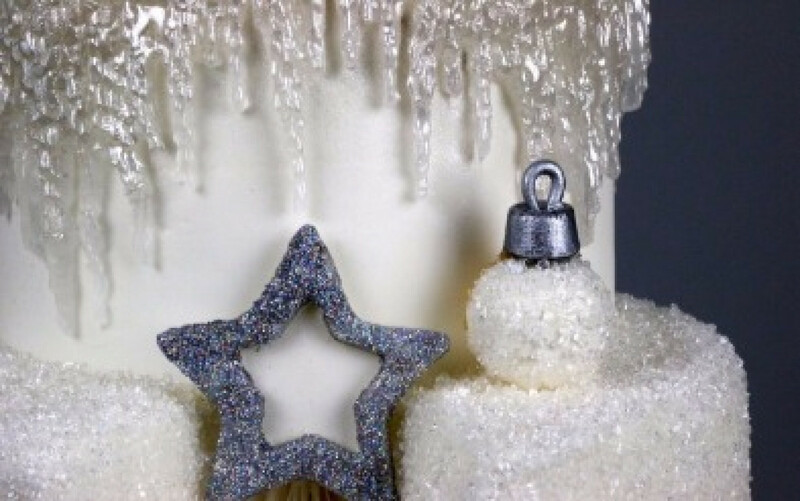 Then it was on to tier 3,I wanted to create the icicles on this cake so I decided to use isomalt . 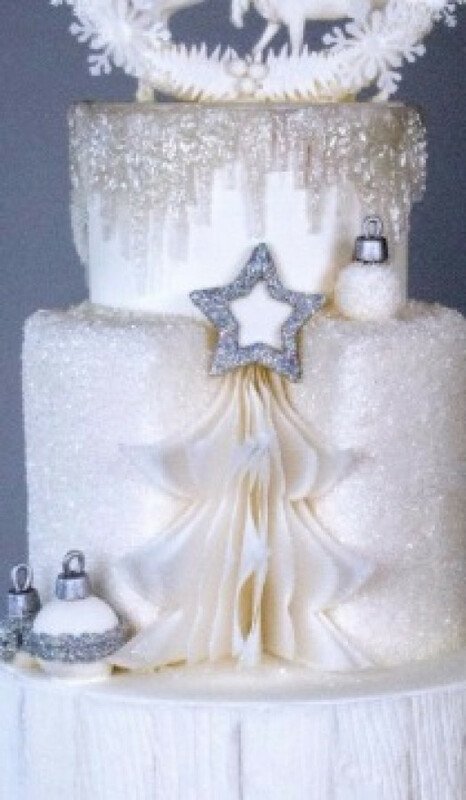 I covered this tier in white fondant and attached the isomalt icicles to the top. Now for the Christmas baubles,3 for the bottom ,2 for the middle and 1 for the top all made from fondant covered foam balls with sparkle of course. 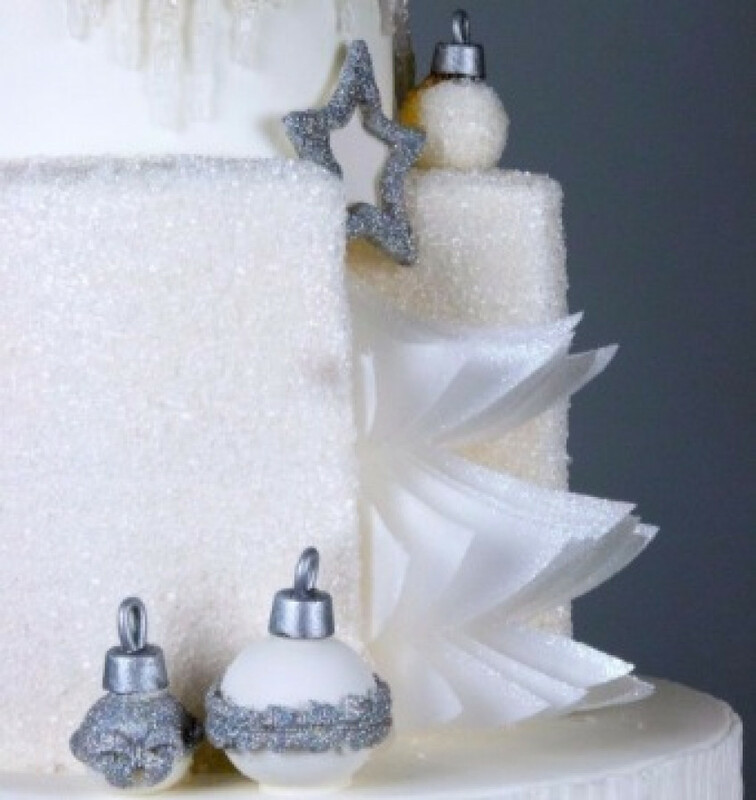 The cake board was next, fondant and sugar mixed with white sparkle dust. I left the wreath for last as this would be the icing on the cake so to speak. I made the buck and the deer to represent the wedding couple. 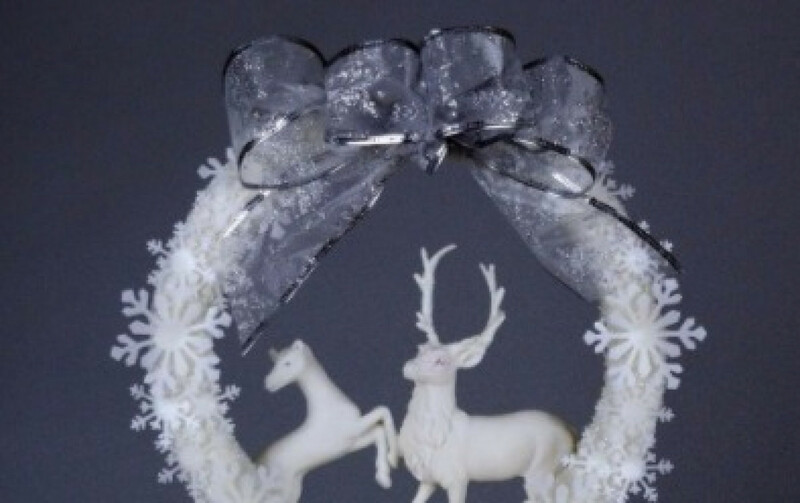 The wreath was an 8’’ foam circle which had to be cut down to fit the top 6’’ tier. 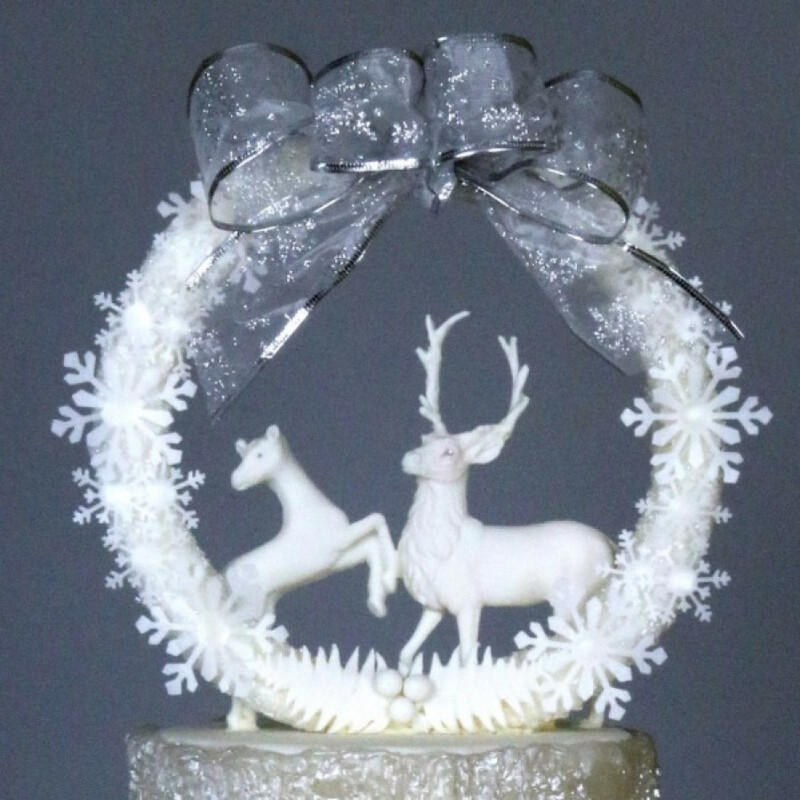 I then covered it in fondant and sugar glued wafer paper snowflakes all around and made the wired ribbon bow at the top. The cutting of the opening for the wafer paper tree was very tricky, I don’t think my knife was as sharp as it could have been. 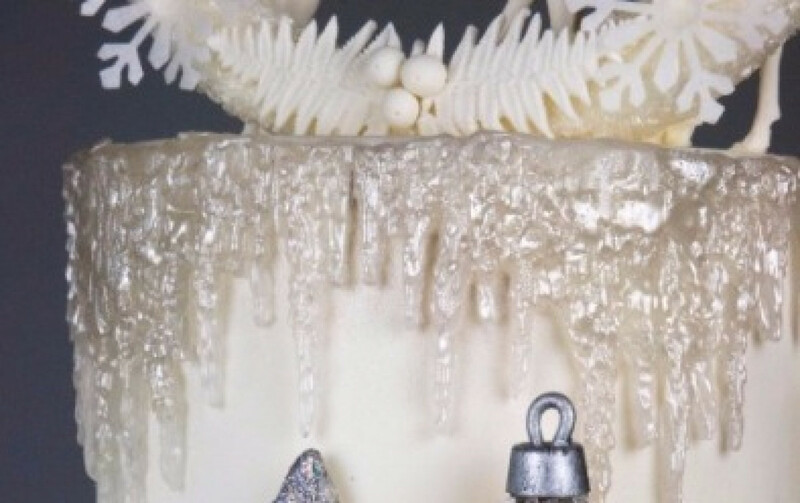 The isomalt icicles were very hard to make and bend to fit the cake without just a couple of war wounds. I can’t seem to use isomalt without burning at least one body part. 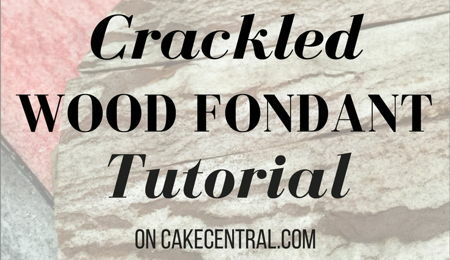 I used the wafer paper / fondant weathered wood technique which is absolutely beautiful on any cake and in any colour. The buck and deer molds from E-Bay,(Art-Prosvet) were absolutely gorgeous . I used Martha Stewart snowflake punches and painted each one with a sterling pearl dust.The icicles were made from isomalt and the icicle mold from First Impression Molds. Last but not least, the silver disco dust for sparkle. Overall, I am very pleased on how this cake turned out. I am always afraid of overdoing it with decor but a little voice keeps telling me “ less is more”. Thank you so much for featuring my cake on Cake Central, I am truly obliged and simply thrilled. Congrats on being featured in CC Nancy. Wonderfully written article. Beautiful cake. Now I finally know what you look like!! Thanks June! It was so exciting! Yes you can Sarahtaylor,no problem.